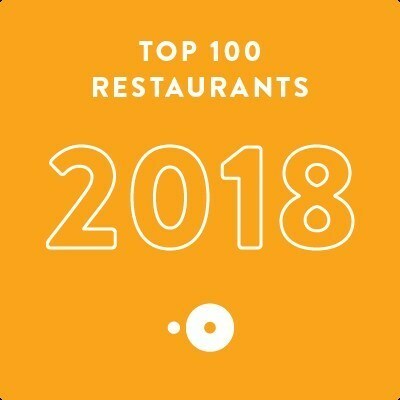 OpenTable Diners Have Spoken: The 100 Best Restaurants in America 2018 | OpenTable, Inc.
SAN FRANCISCO, Dec. 5, 2018 /PRNewswire/ -- Today, OpenTable, the world's leading provider of online restaurant reservations and part of Booking Holdings, Inc. (NASDAQ:BKNG), revealed the 100 Best Restaurants in America 2018according to OpenTable diners. The list is a comprehensive look at the year's most beloved dining spots culled from more than 12 million verified diner reviews of over 28,000 restaurants in all 50 states and Washington, D.C.
From foodie-favorites with world-renowned chefs to breakthrough hidden gems, the list showcases the platform's comprehensive network of dining options for every occasion across the country. New York holds the most honorees with 24 winning restaurants followed by California with 15, Illinois with nine and Texas with eight. Pennsylvania boasts seven winners followed by Washington D.C. with six winners while Florida and Georgia each claim four. New to the list are Colorado, Michigan, Oregon and Rhode Island, with standout restaurants including Matsuhisa Denver, Phoenicia, AgriVino and The Dining Room at Castle Hill Inn, respectively. Additional states represented include Alabama, Arizona, Hawaii, Kansas, Louisiana, Massachusetts, New Jersey, New Mexico, Ohio, Oklahoma, Virginia and Washington. "The 100 Best Restaurants in America list gives voice to OpenTable's diner community by honoring the restaurants they love to visit and that consistently provide dining experiences that delight time and again," said Caroline Potter, Chief Dining Officer at OpenTable. "The diversity of this year's list truly showcases how OpenTable helps diners find the right restaurant for every appetite and every occasion." The list is generated solely from diner reviews collected between November 1, 2017, and October 31, 2018. All restaurants with a minimum "overall" score and number of qualifying reviews were included for consideration. Qualifying restaurants were then sorted according to a score calculated from each restaurant's average rating in the "overall" category.